Spring is coming, and with it comes the itch to throw open the windows, start wearing ballet flats and…get clean and organized. 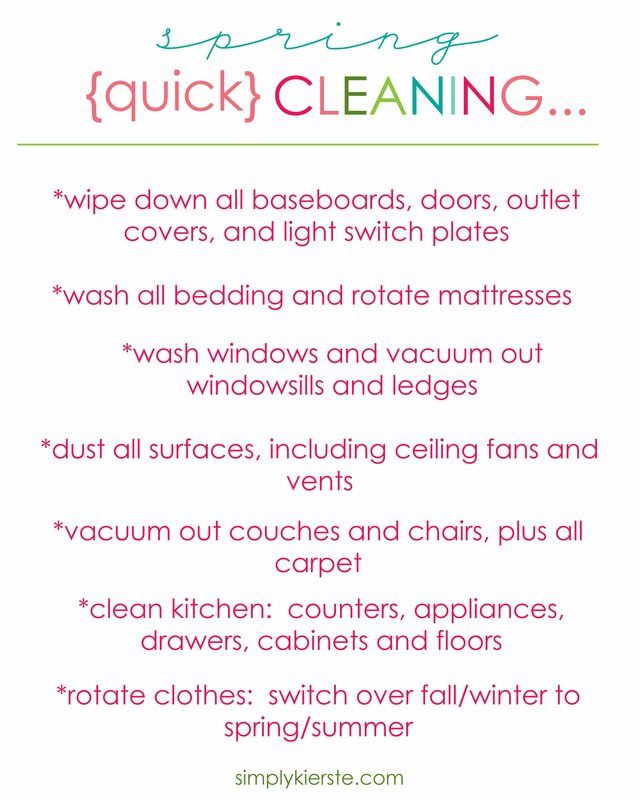 It’s also a really busy time of year, so if you’re on the hunt for a Quick Spring Cleaning List, I’m your girl! I do have an in-depth spring cleaning list that I love, and if you want a totally thorough list, you can check that one out. However, if you’re short on time, I’ve got a quicker version that will help get your home in tip-top shape! I’ve chosen seven items that will cover the basics, and if you tackle just a couple of them a week, you’ll be done in a little over 3 weeks! Your house will feel so much better, and so will you. If you have more time, you can always add in some of the items on my complete spring cleaning list. 1. Make a plan! Print off this checklist, and post it somewhere that you can see it. Map out when you’re going to tackle each item based on your schedule. 2. Get help! Include your husband, kids, and family to make it faster work. 3. Gather all your supplies ahead of time–rags, cleaners, etc.–so you don’t have to stop once you start. 4. Make it fun! Crank up the music, open the windows, and set out some fun snacks! You can download the printable below, then hang it on your fridge, or slide it into a sheet protector or even a frame so you can use a dry erase marker. Hi Kierste, We are coming out of Summer here in Australia but I definitely need to get some of those things done that you have on your spring cleaning list. My windows and window sills are very much in need of a clean. Your list has reminded me of what I need to do, thankyou!